I often get asked what’s the best thing to do on Whidbey Island. Now, as far as best, I can’t really say, there’s so much to do and I haven’t even come close to doing it all. But, I do have some suggestions. I’m going to sound like a travel agent, but there’s so much cool stuff to do on the island. Depending on how early you start, I’d suggest starting your day for a nice hike at South Whidbey Island Start Park where you’ll hike though the forest and down to the beach, possibly encountering some squirrels and bunnies along the way. After your hike, stop for lunch at Greenbank Farm’s Whidbey Pies & Cafe. It’s a little cafe with really good fresh food in a super casual atmosphere. Greenbank Farm is a fun place to walk around; you can tour the farm, look at their small lake, watch birds, tour some art galleries, and shop in the cheese shop. Sometimes there’s a Farmer’s Market (I believe it’s on Sundays). Head on over to Langley for some shopping and more exploring. Be sure to see Boy and Dog at the Seawall Park, and head down the long staircase to the ocean. If you’re in town for more than a day, I recommend stopping at Callahan’s Firehouse for some hands-on glass blowing, where you can blow your own glass (with Callahan’s help). You will need to go back the next day to pick up your creations. While in Langley you can go kayaking with Whidbey Kayaks. Being out on the water is a special treat, and you might even get to see seals, sea lions, bald eagles, or whales while you’re out there. You’ll love the food at Cafe Langley, which features Mediterranean cuisine. If it’s a nice day out, upstairs at Prima Bistro they have great French food and a lovely patio that you can sit out on and look out at the water. Take a tour through Meerkerk Garden for beautiful displays of flowers. We love going to Fort Casey for a nice hike with a tour of their lighthouse, great views, a short walk down to the beach with lots of driftwood, and maybe see some Stellar Sea Lions up close, and some wonderful military history. Not too far from Fort Casey is the town of Coupeville, for some more shopping, and head out to the end of the pier, and sit on the patio for some world famous Penn Cove Mussels at Kim’s. Stop in at the Lavender Wind Farm to see all the wonderful purple flowers. Stop in at one of their stores to see what’s for sale. Deception Pass has great hiking trails. You can read the guides once you get there for which trails interest you. And, then just work your way down the island. And, a big shout-out to a wonderfully super-helpful site, Whidbey Local, who has helped me out many times. If you’re looking for anything Whidbey, they’re the ones you want to check out. 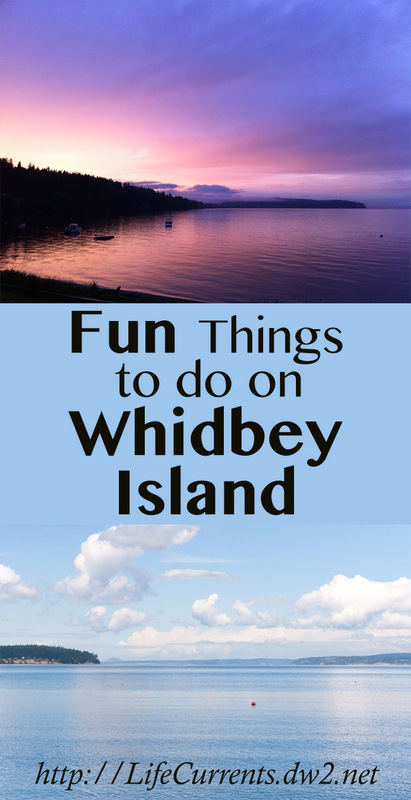 This is just a partial list of so many really fun things to do on Whidbey Island in Washington, USA. Have you ever been there? What’s your favorite thing to do? I have never been there, but it sounds wonderful! Awesome! All my trips to Seattle & the islands there, I’ve never been to Whidbey. Need to change that! Great post! I’ve always wanted to visit the Pacific Northwest and I’d love to try everything you recommend, that’s my kind of vacation. Hi Stephen! Thanks for the comment! Always nice to “meet” a fellow Whidbey person. I actually live full time in California now, but hope to live in Whidbey some day in the not too distant future. I too miss it when I’m not there. For now, I’m lucky enough to get to go there often. How cool that both your Grandma & Grandpa are from there, and the first Dr., wow! So cool. Thanks for saying hi! This is a wonderful post and I liked it very much to read about Whidbey. I love travelling and food and your post just seemed tailored for exactly what I like to read about the most! Thank you for writing this, I loved it! Sounds just great, had to find it on a map! No wonder you enjoy your trips there so much! Of all the places in this country, it’s my favorite. My dad was stationed there ( Navy). I hope to go back one day for a visit. Now I’m so homesick! I basically grew up on the island – spent every summer and most weekends there. We loved to explore Fort Casey (and there were some pretty adventurous places to snoop in there) but never even knew you could tour a lighthouse! The restaurant at Greenbank is wonderful. Mostly, just give me a big beach towel and let me lie on the beach, listening to the gulls and the waves. Lorinda, you are welcome to come over anytime when we are there! (currently, we are not there lol) I even serve wine!